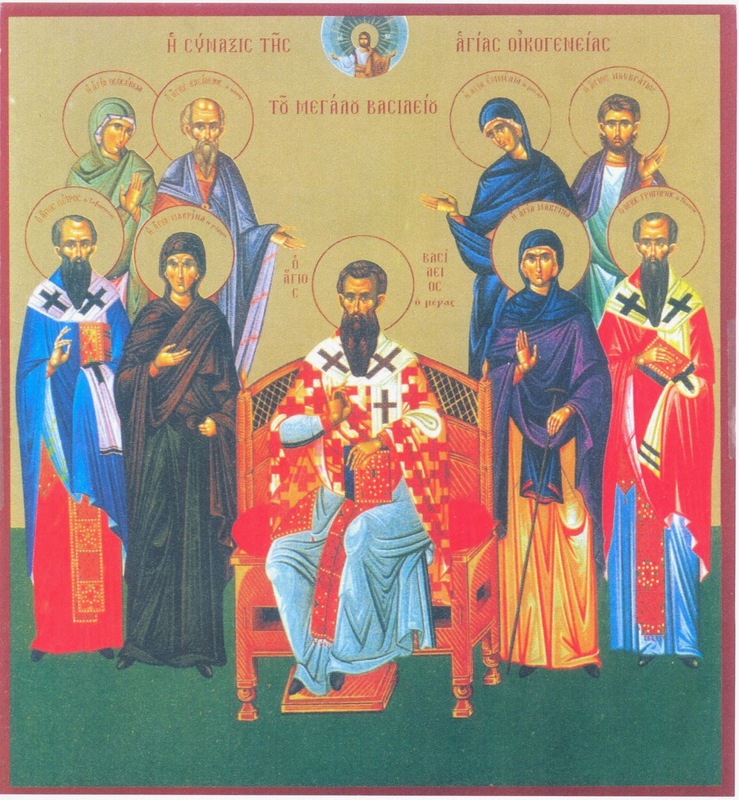 On September 4th, 1998 the Holy Synod of the Church of Greece established the Feast of the Holy Family of Saint Basil the Great to promote and bless the sacred institution of the family. The celebration for this feast was established for the second Sunday of January. Few entire families have been officially celebrated by the Church through the centuries. 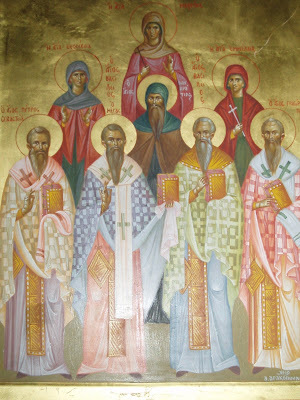 Of the ancients, two families that quickly come to mind are those of Gregory the Theologian and Basil the Great. These families, beginning with the parents, created an atmosphere in the home that was spiritually healthy, for it was an atmosphere of love for God coupled with love for virtue, philanthropy and hospitality. Basil was born about 330 at Caesarea in Cappadocia and reposed in 379. 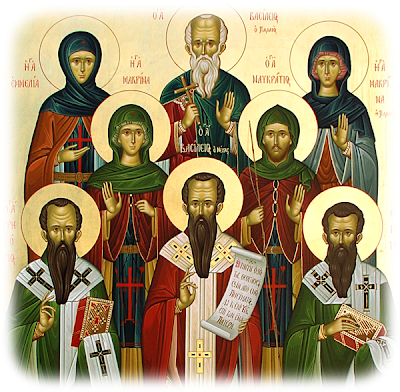 He came from a wealthy and pious family, including his father Saint Basil the Elder (+ 349), his mother Saint Emmelia (+ 375), his grandmother Saint Macrina the Elder (260-340), his sister Saint Macrina the Younger (c.330–379) and his brothers Saints Gregory of Nyssa (334-394), Naukratios of Mount Nitria (332-358), and Peter of Sebaste (345/7-392). It is also a widely held tradition that Saint Theosevia (c. 335-c.385) was his youngest sister (though some claim she was the spouse of Saint Gregory of Nyssa), who is also a saint in the Church. There are also about four or five other girls, unknown sisters of St. Basil, who flourished in the married life, and the unknown grandfather of St. Basil who martyred for the faith. 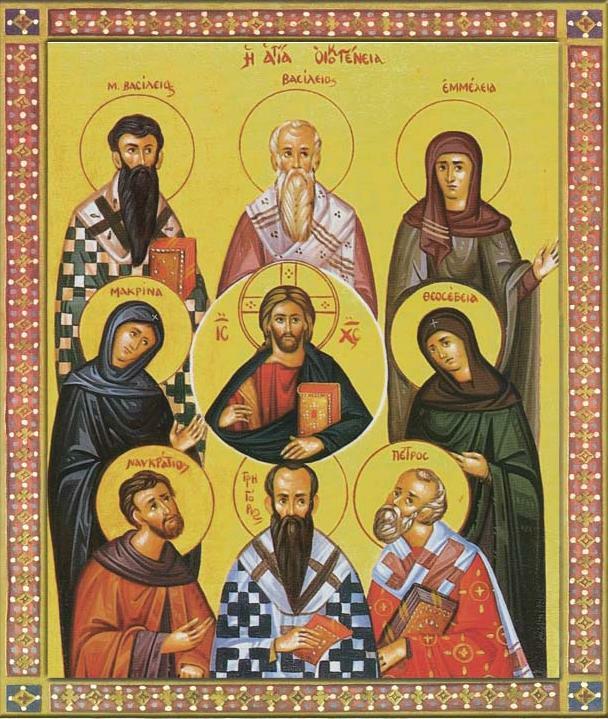 Paradoxically, however, and despite the Synodal decision above and the related Synodal Encyclical, it was officially only celebrated nationwide in Greece for three years and then it disappeared, even from the official calendar of the Church of Greece. Perhaps this omission of the feast from the diptychs of the Church of Greece was an oversight and it is believed that it will be corrected. Nonetheless, the feast was celebrated this year (2013) in places like New Philadelphia, Greece in the Church of Saints Basil the Great and Kosmas Aitolos. The Service for the Feast of the Holy Family of Saint Basil the Great was written by the late Hymnographer Fr. Gerasimos Mikragiannanites. 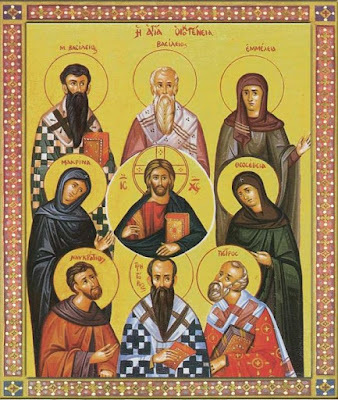 An eight-numbered system of servants of Christ, Basil we celebrate together with Emmelia, Basil the Great, Gregory with Peter and the divine Naukratios, the God-bearing Macrina as well as Theosevia; as a divine family they were well-pleasing to Christ.